Students are encouraged to live according to the tenets of Tae Kwon Do. Courtesy: Tae Kwon Do students and instructors should be polite and show consideration for others. Integrity: Tae Kwon Do practitioners should live by a code of moral values and principles. Perseverance: Students should welcome challenges because challenges cause us to grow and improve. Self-Control: A Tae Kwon Do student should practice controlling their actions and reactions. Indomitable Spirit: A Tae Kwon Do student should never be dominated by or have their spirit broken by another. When exercise is done consistently, invaluable physical and mental improvements occur. Students develop real and lasting self-confidence. Tae Kwon Do students do exercises which develop strength, flexibility, endurance, speed, balance, memory, concentration, coordination and self-control. Some of the keys to the success of Tae Kwon Do is that the exercises are fun, the students see results, and they are inspired to do more. Tae Kwon Do training develops self-confidence. Success in a personal development program, such as a Tae Kwon Do class, where the students experience noticeable increases in strength, flexibility, memory, coordination, and self-defense skills as the result of a dedicated effort, is an excellent foundation for self-confidence. It is self-confidence based on physical and mental self-improvement, as opposed to self-confidence based on one's athletic performance. This self-confidence is deep; it is not subject to the results of tomorrow's game. 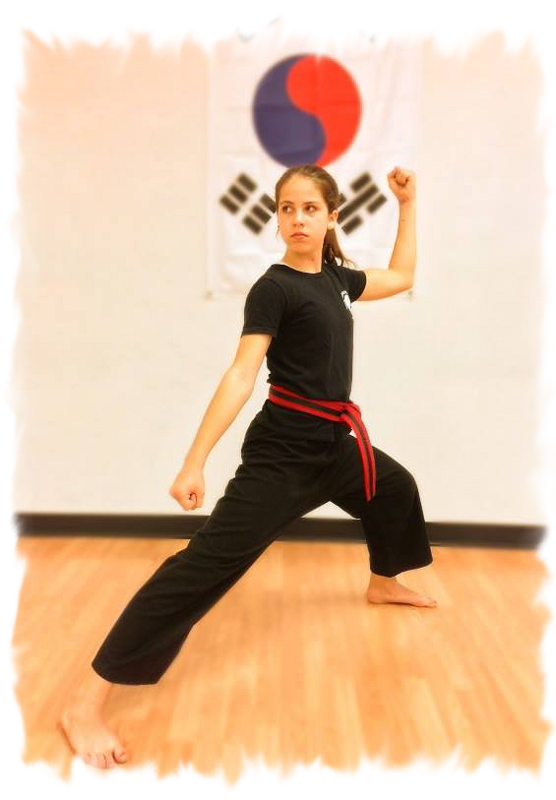 It is not reserved for the best players on the team; it is available to everyone, because everyone experiences improvement with Tae Kwon Do training. Early Koreans developed unique martial arts forms for unarmed self-defense to complement their skills with weapons. The first recorded evidence of what was to become modern Tae Kwon Do is found about two thousand years ago in Korean history. A mural painting from the Koguryu kingdom (37 B.C. to 66 A.D.) was found in a tomb believed to have been built sometime during the period 3 to 427 A.D. This mural depicts figures practicing martial arts techniques. Historical records from this Koguryu period also mention the practice of martial arts techniques and tournaments. The early forms had different names, such as Kwonbak, Bakhi, Dangsoo, Taeso, and Kongsoo. From about 600 A.D. to about 1400, the dominant form was Soobak, which further evolved into Taekyon beginning in the late 1300s. Taekyon was the dominant Korean martial art form until the Japanese invasion and occupation of Korea in 1909. From 1909 to 1945, the Japanese suppressed Korean culture and martial arts and introduced Japanese culture and martial arts. The modern period of Tae Kwon Do began with the defeat of the Japanese and the liberation of Korea in 1945. Korean martial arts masters wanted to eliminate Japanese influences. They began discussions on how to return to the traditional Taekyon based Korean martial arts and on how to unite the various martial arts schools (or Kwans) and styles into a single style and national sport. After several years of discussions, the name "Tae Kwon Do" was chosen in April 1955 by the board of masters of the various Kwans, and the kwans started to unify through the late 1950's. The spread of Tae Kwon Do as a martial art and competitive sport continues to this date. Today Tae Kwon Do is by far the most widely practiced martial art in the world.